Here's a short video on why attendance is important. #BCSTech Podcast - Episode #4 - Traci Blackburn and Beth Fugate. Instructional Technology Coordinator Scott Webb (@Swebb_32) hosts the #BCSTech Podcast featuring ELA Coordinator Traci Blackburn (@TraciBlackburnB) and Math Coordinator Beth Fugate (@mrsf4math) In this episode, we discuss the district ELA and Math goals, Open Court, Math Teacher Leaders, and selfies. #BCSTech Podcast - Episode #5 - Patrick Spangler. Instructional Technology Coordinator Scott Webb (@Swebb_32) hosts the #BCSTech Podcast featuring Bradley Central High School Assistant Principal Patrick Spangler (@Bears00) In this episode, we discuss Patrick's teaching career and move to administration, the great things happening at BCHS, and his recent trip to Germany. Website Tutorial #1 - How to change your profile picture. Here is a quick tutorial on how to add a picture to your profile. This is will work on all Bradley County Schools sites. 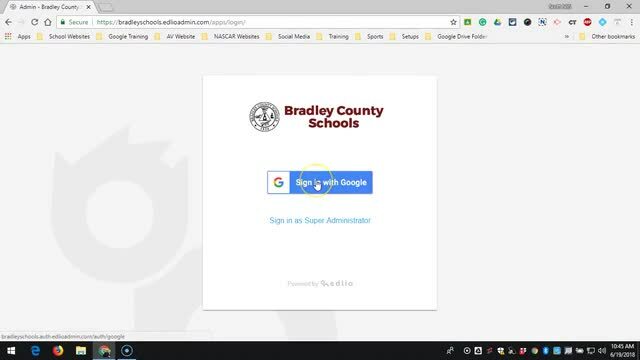 The video shows how to add a picture on the District site. #BCSTech Podcast - Episode #3 - Bo Borders - WVHS MBA Academy. Instructional Technology Coordinator Scott Webb (@Swebb_32) hosts the #BCSTech Podcast featuring Walker Valley MBA Assistant Principal Bo Borders (@BBorders_46). In this episode, we discuss the teaching profession, WVHS MBA Academy, and the really cool #edtech Anatomage table.